Just yesterday, Amazon announced that Jeffrey Tambor was officially fired from the upcoming fifth season of Transparent following sexual harassment claims made by two women. But the Emmy-winning series isn’t the only project on the actor’s roster. 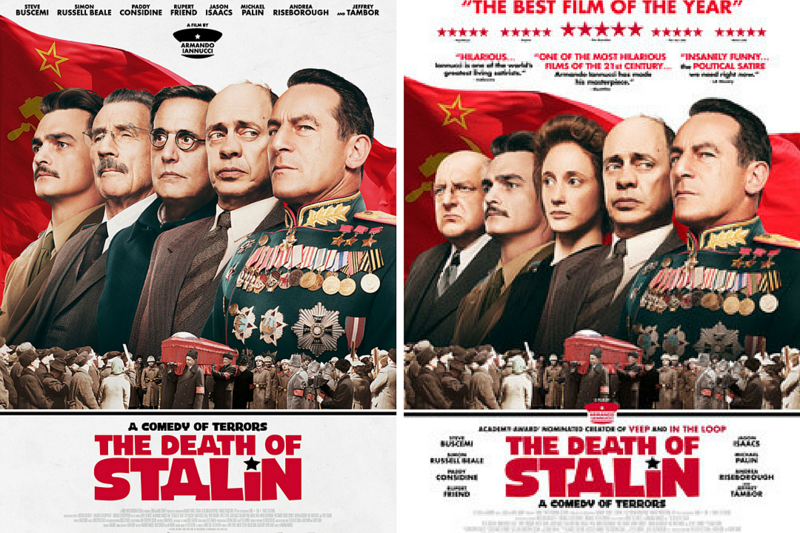 He stars in the upcoming political comedy The Death of Stalin, but as of this week, Tambor has seemingly disappeared from the poster. The Wrap first noticed the change when IFC uploaded a new poster to the film’s press site. While the previous version featured Tambor in the middle, surrounded by co-stars Michael Palin, Steve Buscemi, Rupert Friend, and Jason Isaacs, the new poster replaced Tambor with Andrea Riseborough. The Wrap notes that the new poster for the Armando Iannucci film was unveiled hours after Amazon announced the results of a months-long investigation into the harassment accusations against Tambor. But that’s not the only change to the poster. Oddly enough, Palin has been removed and replaced by co-star Simon Russell Beale. Is this IFC’s way of pretending that the change has nothing to do with the Tambor allegations? A playful nod a Soviet censorship? ScreenCrush has reached out to the publicity firm handling The Death of Stalin for comment, but none was received by the time of publication. The Wrap reports that both versions of the poster were approved by the filmmakers and that, according to their source, the Tambor version was made specifically for the U.K. That may be true, but the Tambor version is the only one I’ve been getting in emails for the U.S. press for the film. Tambor has a few other projects lined up. He has voice roles in The Adventures of Drunky and Amusement Park, and was set to play the lead in Disney’s Magic Camp, but that project was removed from the studios schedule, though notably before the allegations broke. The Death of Stalin hits theaters on March 9.